Albarello on foot, blue and whie tin-glazed earthenware, used for philonium romanum (PHILON. ROM.) 218 mm x 109 mm diameter, 760g. Unknown maker, Dutch, 1650-1750. Tin-glazed earthenware drug jar, peacock motif, used for Philonium Romanum electuary, now empty. 164 mm x 105 mm diameter, 563 g. Unknown maker, Dutch, 1751-1780. Albarello vase on foot, with polychrome maiolica glaze, used for a laudanum (opium tincture) preparation (LAUD. NEP. QUER). 138 mm x 70 mm (foot), 317 g. Unknown maker, North Italian, late 18th century. Glass specimen phial of homeopathic opium pills, now empty. 55mm. Homeopathic medicine is based on the 'law of similars' that 'like is cured by like'. Dispensed by Dr. William Schwabe, German, 1870-1930. 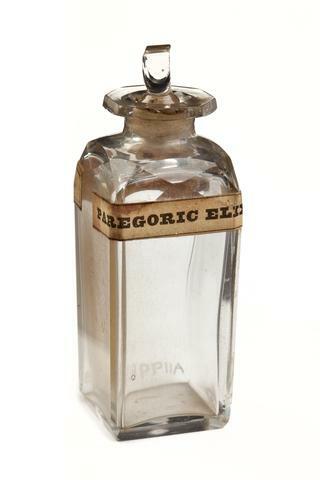 Glass bottle with ground glass stopper for Paregoric Elixir, now empty. 87 mm x 30 mm x 17 mm, 51g. Produced by the Junior Army and Navy Stores and dispensed by J. Fuller, English, c. 1870. 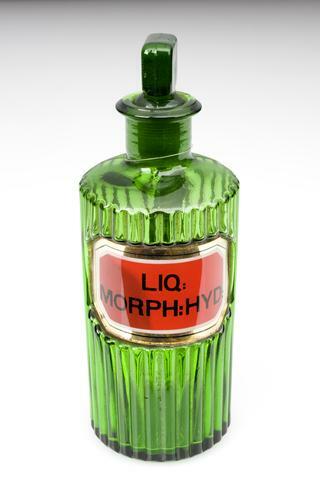 Narrow rectangular glass bottle with glass stopper, empty, originally contained chlorodyne. 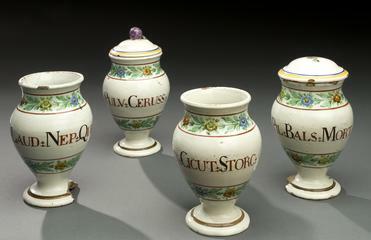 89 mm x 32 mm x 20 mm, 73 g. English, 19th century. Glass bottle, with painted label,"TR OPII CROC" (opium tincture), empty, stopper missing. 94 mm x 60 mm x 60 mm, 102g. Unknown maker, probably English, 19th century. Syrup jug, with handle, spout and foot in polychrome maiolica glaze , used for poppy capsule syrup (SYRUP. PAPAV. CAP). 171 mm x 73 mm diamter (lid), 520 g. Unknown maker, Italian, 1760-1860. Syrup jar, tin glazed earthenware, peacock feather motif, used for opium syrup, inscription "SYr:MECON". 185 mm x 143 mm diameter, 797g. Unknown maker, English, 1720-1750. 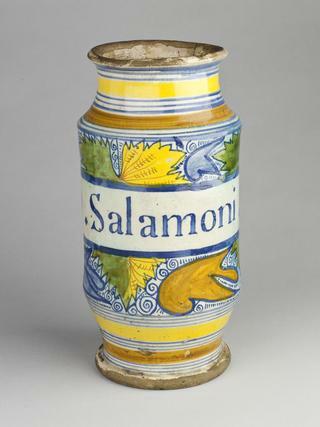 Pharmacy storage jar, polychrome faience glaze, used for salomonis opiate (OPIATA SALOMONIS). 240 mm x 135 mm diamter, 1023g. Unknown maker, France, perhaps Sceaux, 1750-1800. Tin glazed earthenware drug jar, peacock motif, used for Philonium Romanum electuary. 183 mm x 108 mm diameter, 618 g. Produced by a Delft factory, Dutch, 1700-1770. 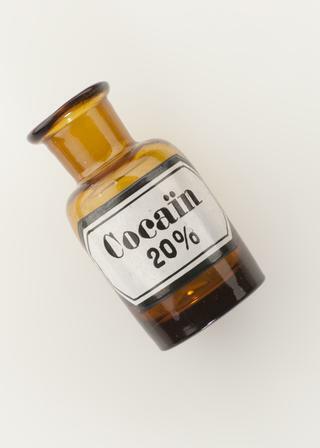 Wooden drawer for opium (one of four), now empty. 38 mm x 120mm x 110mm. Fogelbert Chawner, English, c. 1789. Black guetta percha tube for Opium and Lead tablets, now empty. 88 mm x 20 mm diameter, 19g. Burroughs Wellcome and Co., London, 1910-1924. Glass bottle with stopper missing for 'Alcool camphre' (camphorated alcohol). 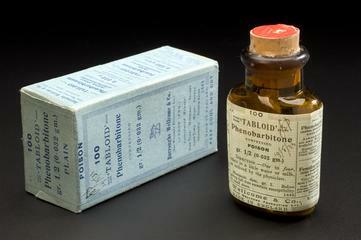 121 mm x 46 mm x 32 mm, 130 g. Prepared by Mapcotte Chemists, Paris, 1820-1900. 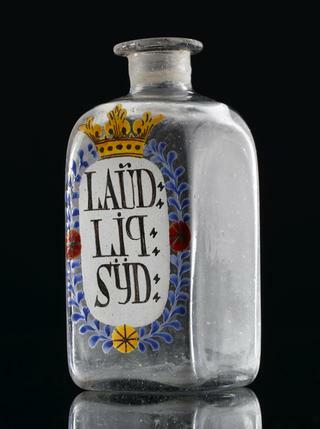 Painted glass bottle, opaque white, inscribed "Laud:Liqv:Syd" (Sydenham's laudanum), empty. 101 mm x 53 mm diameter, 81 g. Unknown maker, possibly German, 18th century. Earthenware polychrom maiolica glazed syup jar with spout, foot and figural handles, for poppy syrup (SYRUPUS PAPAVERIS RHOAEDOS), now empty. 215 mm x 80 mm diameter (foot), 641 g. Unknown maker, Northern Italian, 19th century. Creamware syrup jar with foot and spout for poppy syrup (S.E. MICON), empty. 200 mm x 100 mm diameter (foot), 660g. Wedgwood, made in Staffordshire, 1810-1830. Large dark glass pharmacy bottle with iron top used for opium tincture, or laudanum, (TR: OPII), now empty. 430 mm x 170 mm diameter. 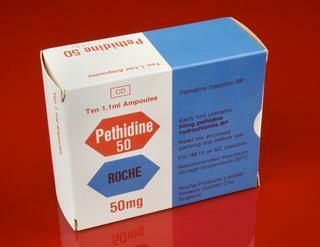 Label indicates the formulation was 'Specially prepared for veterinary use'. Unknown maker, Dispensed by Bird & Storey, Oxford, English, 1801-1850. 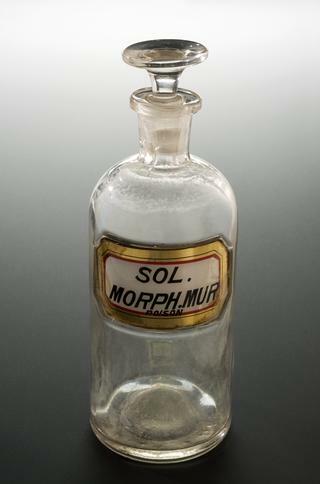 Clear glass poison bottle with glass stopper, designed to dispense in small quantitites, labelled "TR:CAMPH C OPII". 250 mm x 85mm diameter. Unknown maker, British, 19th century. Empty tin-glazed earthenware albarello, displaying the emblem of the monastery of Sahagun, labelled "EXT OPII" (opium extract). Unknown maker, probably Sahagun, Spanish, 18th century.